Look what I stumbled across! These are undeniably adorable but it’s impossible to tell it’s LS! I’m really surprised. What do you guys think? Skip to about 1:50 in the video. The pictures below are from Diskingdom.com, all credit goes to them. I eventually review nearly everything. Well, except Descendants, I won’t waste my breath on those. Well that makes me a little sad.They are still LS, don’t they deserve at least a chance even though you don’t agree with the packaging? I actually saw these in a websearch on LS, but I wasn’t sure it was lip smackers at all. It really doesn’t look it and it doesn’t even have their name. Still, I’m so tired of all this Disney. If Markwins continues this, I think I’ll just spend money on Ebay and get old LS on there. I can’t stand Disney Channel and I don’t understand why everyone on Facebook is so giddy about it. Like what’s so great about having some teeny-bopper on your lip balm? Yuck! Right, that’s how I feel about it! It’s really impossible to tell, and they’ve removed their front-facing branding in favor of Disney’s. It’s interesting/confusing. Forgot to add: I wouldn’t mind a Nancy Drew lip balm. Imagine the 1930’s original artwork on the balm like The Secret In The Old Clock. It would be retro and nostalgic or even Peanuts, the comic strip, which I would love and the best part it wouldn’t just be for “kids” but for everyone of every age. I would love it if they made Adventure Time and/or Steven Universe Lip Smackers. Both of those cartoons have child and adult fans, so I think many people would buy them. You won’t believe they have on LS website. When you go on, on the bottom of the right hand screen a black square pop ups asking: have a few spare minutes to help us improve our website? then it says yes or no. I thought it was a survey and was going to write saying how I hate the Disney rotation and add more original LS, but no. instead I followed the prompts and was utterly confused by what I was doing. When I was done and hit finished, it said: thank you for helping us organize our site. I was like what???! Why should we, us consumers, help organize your website? How dumb is that? I don’t understand that at all! I thought consumers were supposed to send feedback, not help with their company! If they want that, then they should HIRE people to do that. Now that’s subetl! Great to hear from you. This to me is more Disney-esque. Looks better than having Disney all over a regular Lip Smacker tube. I wonder what the quality of the balm is, if decent I might buy. I’m wondering if there’s a Lip Smacker logo/sticker on the bottom. If not, what a missed opportunity for brand awareness for Markwin’s and not a smart move on their behalf. I did notice that they are marketing some Chupa Chup EOS-like ball balms, and lollipop glosses that don’t have their logo on the packaging. Bizarre. Anyway, this makes sense for a Disney partnership, all packaging, very novelty, so maybe they will take a backseat from slapping Disney partnerships all over our regular beloved Lip Smackers. I’d buy to try but am at the point where I don’t want to support their Disney lines. LS better be treading careful if their going to do an EOS-like balm packaging because EOS is filing new 337 complaint regarding certain lip balm products. Instead of pasting a link, I’ll just paste the text. Here it is: On June 12, 2015, eos Products, LLC and The Kind Group LLC (collectively, “EOS”)—both of New York, New York—filed a complaint requesting that the ITC commence an investigation pursuant to Section 337. According to the complaint, the ‘391 patent generally relates to a lip balm applicator. In particular, the applicator has a receptacle that includes upper and lower portions that may be connected together such as with interconnecting threads. Lip balm is mounted in the lower portion on a support platform. The receptacle may be substantially spherical, substantially cylindrical with rounded surfaces, egg-shaped, ovate, or the like. In the complaint, EOS states that the Proposed Respondents import and sell products that infringe the ‘391 patent. The complaint specifically refers to the beauty 360 Revo lip balm product, the “Well at Walgreens” Revo lip balm product, the Revo ChapIce lip balm product, and the three-pack Revo ChapIce lip balm product as infringing products. Regarding domestic industry, EOS states that its EOS-branded lip balm products practice the asserted patents. EOS further states that both it and its contract manufacturers/licensees have made and continue to make significant investments in plant and equipment, a significant employment of labor or capital, and substantial investments in the exploitation of the ‘391 patent in the U.S. The complaint refers to a confidential declaration of one Sanjiv Mehra as providing the details of EOS’s and its contract manufacturers/licensees’ domestic investments. As to related litigation, EOS states that on June 4, 2015, it filed a complaint against the Proposed Respondents in the U.S. District Court for the District of Delaware alleging infringement of the asserted patents. With respect to potential remedy, EOS requests that the Commission issue a limited exclusion order and cease and desist orders directed at the Proposed Respondents and others acting on their behalf. Here’s the thing, the Revo’s design is very similar to EOS, so those claims make sense. I’m surprised EOS is still doing good after all the claims of fast molding balms on their Facebook. Truthfully they need to start doing balms like these, with a designed cap. Their line with eight flavors will only carry them so far because the actuality is the formula of EOS is not very good. So, new flavors and innovative designs will keep them relevant. Now, Markwin’s Chupa Chups ball balms strike a similar format to EOS, but I do think they’re safe with these. I wonder what the flavors are…. Also, I’m ready for fall/holiday flavors!!! I heard there will be a Pralines & Cream flavor!!! LS has a very recent pattern of copying. First, they competed with dollar store junk style brands (Lotta Luv) by churning out a bunch of Disney crap, constantly. Then they competed with Baby Lips (very poorly I might add) which barely made waves even online and we forgot about it as soon as it happened. Now they’re trying to further confuse consumers with these 100% EOS copied balms, hoping that they can get in on the tail end of this trend. Yes these are cute, but they aren’t LS…they’re something else, meant to grab $$$, not represent the brand. LS used to set the trend, now they don’t, and they’re going into what is probably lawsuit worthy territory. It doesn’t matter anymore if LS has a good product and EOS has a bad product. Reassuring ourselves that LS is better doesn’t change the fact that Markwins is clearly willing to throw the branding aside in favor of 15 minute trends. It’s gross, it reeks of corporate desperation, and it’s not what the Bell family would have wanted. Yup, that’s exactly what LS has been doing probably since they noticed the books weren’t doing so great and they thought copying others meant they could ride on the coattails of their success. It was even mentioned in a review on Glassdoor of Bonne Bell. Even Bonne Bell’s lipsticks (featured in the color and flavor workship) look so similar to NYX Butter Lipstick. This reminds me of like trends in books or so. Remember the vampire craze in YA when Twilight became hot (regardless how old you are or not)? Everyone started writing and the publishers kept publishing vampire/werewolf books left and right in the fantasy section of YA. What happened the market became too saturated and no one wanted to take on those types of books both agents and publishers and the same thing is happening with dystopian (e.g. Hunger Games and Divergent). Then no one wants to touch them. LS has to really, really seriously buckle down and do good for the brand and reinvent, evolve it, but I don’t know what to think since we won’t get the full Markwins taste until 2016. The only thing we have is the trolls. But copying off other people’s ideas isn’t right whatsoever. If I copied off another writer’s idea (e.g Ally Carter’s Heist Society books word for word) she’d sue me. Besides, that’s not my thing. I’d rather set the trends and everyone follow, not the other way around. I get it, I really do but something to understand is the cosmetics world is very cut-throat nowadays. Most things are not innovative nowadays. Once someone launches something ‘new’ it’s only a matter of time until another company tries to one up them. Especially with prestige cosmetics. I can’t tell you the last thing something that launched that set a company apart that was truly unique. Nowadays it’s 2.0, who can do it better. Lip Smacker was the trend setter in flavor authenticity and innovative flavors, now everyone has flavored lip products. I just recently read how patenting/copyrighting flavored make-up might be a thing soon. THIS is where Markwin’s can shut down competition. how I’m curious to see what others think they could do to reinvent the brand. Also, I just read something about how it’s been 10 years since Jess Bell’s passing. So sad. Um, I don’t know how I feel about these. 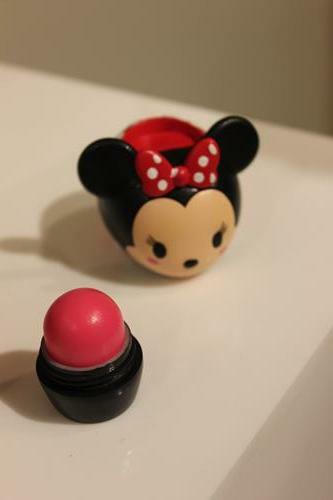 On one hand we’re all pretty sick of Disney and I don’t really like any of those sphere lip balms of any brand. I have bought a few (3) for unique flavors, but I rarely use them. 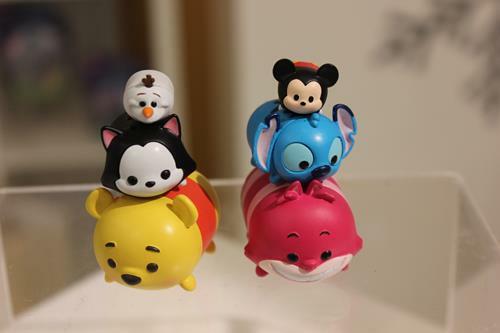 On the other hand, I like the fact that you can stack them up and Stitch is pretty cute! I don’t think I’ll hunt these down, but if I happen to come across them and the flavors sound good and the price is reasonable, then maybe. Adorable this is, no doubt about it. However, the only reason I love lip smackers is because they are reminiscent of my childhood. I’m losing interest. Has anyone been able to find the Comfort Foods trio? I heard it was being released this month, but I’ve seen no pictures or reviews on it. 🙁 Does anyone know if it’s in stores yet? I have not seen it in stores yet, but I’m on the hunt! I will let you know asap! Also have been looking for Halloween. I’m thinking they’ll be at Walgreens. Markwin’s is pretty terrible at giving customers any type of direction, seriously. They said ‘it’s varies on the store’ on their Facebook page. What does that even mean!? I know holiday will start popping up at any time too. Everyone keep your eyes peeled! I recommend checking Kmart for the holiday collections. The Kmarts in my state tend to be good with carrying the holiday sets…. just not the other stuff. That’s where I found last year’s holiay collection. Yes Kmart here has A LOT of Lipsmackers. Haven’t seen the comfort foods trio tho. I found some interesting Lip Smackers at Kmart. They have some sports-themed ones in different flavors. None of them are new, but you might like them if you’re tired of all this Disney crap. I forgot to add what flavors I remember seeing of them. There was tropical punch, salted pretzel, buttered popcorn, cotton candy, root beer, and a sixth one I can’t remember. I was surprised to see them. Did you take pics?!? This is very interesting…how was the packaging? I checked my local Kmart and nothing new, just Inside Out and the Descendents. I’m assuming Halloween/Holiday will pop up any day. Wasn’t expecting this sports theme. Markwin’s is TERRIBLE at promoting anything new, just terrible. Also, looking out for Comfort Foods. Unfortunately, I didn’t. I really should have though. The packaging was in the shape of shirt/sports jerseys and the colors of the Lip Smackers matched it. They were on the front display in the cosmetic section where the new products were at. It really depends on how often and how much you use it when you apply. I know I go through mine pretty fast, but I’m the kind of person to really pile lip balm/lip gloss/lipstick on. I would say I go through one about 1-3 weeks, but I’m usually using up one at a time. If you use a different flavor every day, then it’ll take a longer time to use them up. Also, I like to use most of them up, save them, and move onto the next one. I do that just in case I liked the flavor or if I run out of backups. I’ve used some up in as little as 2 weeks, and some took years. I try to wear a different flavor everyday, but sometimes I get really attached to one and wear it a lot. I just saw someone post on Facebook about those sport LS lip balms and as much as I like sports, I can’t stand sport jerseys. I’m sorry, but I’m not a fan of the packaging, but that’s just my thing. How are the flavors, though? The flavors aren’t new. Cotton candy, buttered popcorn, salted pretzel, tropical punch, and root beer. Oh and I forgot to mention frozen lemonade. Well, that’s a real letdown. Old flavors in new packaging. Ugh! It might be a fun little gift for some people though. Ive used a few up in 2 weeks or so….like “Bubblegum Frosting”. Had to buy 4 backups cause I used it up so fast. I use up Dr Pepper pretty quick cause I keep it in my purse and use it when I dont wanna bother with lipstick. Still havent seen the comfort trio….I want that one desperately! Me too! They sound amazing! I wonder if hot cocoa will smell like the snowflake cocoa from the holiday 2014 collection. If it does, I’ll be disappointed. I didn’t really like snowflake cocoa much. I didnt care for any of those in that collection they smelled generic. I gave the set to my daughter. Has anyone found any information on the holiday Lip Smacker sets? I really wanted to know what the flavors are. I heard on the Facebook page that one of them is Pralines n’ Cream which should be nice. I was at Target earlier and didn’t see anything new, but I did snag the very last Chocolate Mint, which has become very rare. Haven’t tried it yet, though. I haven’t found chocolate mint anywhere in my area. Same with the 70’s and 90’s trios. My local Rite Aid doesn’t sell them. I don’t have Chocolate mint….I prolly should get it while I can. And Pralines and Cream? Yum! More interested in Oatmeal Cookie tho. I’ve been seeing this one collection on ebay called the Cupcake Craze Lip Collection. The flavors sound VERY similar to some Lip Smacker flavors from last year’s holiday collection, only repackaged with original labels (they actually look pretty cool). The flavors are angel food cake, coconut flake, blackberry cream, and white chocolate. If any of you had trouble finding these flavors last year, this is your chance to get them again but in original style packaging. I just might get them if I can find them in stores. Ive seen those too. None looked appealing to me. Has anyone been able to find the Comfort Foods trio? I haven’t seen it on ebay or anything! I thought it was supposed to be in stores in September. 🙁 I was looking forward to finding that trio. I have been on the prowl since the end of August, since they told us it’d be out in September. Well…it’s October. Nothing. I REALLY want Oatmeal Cookie! I’ve only seen the newly packaged cupcake quad (glad to have an Angel Food Cake in simple, original packaging!) and the Halloween trios which are repeats from last year/of flavors they already have, plus they’re Disney. The Strawberry Jelly Macaroon is pretty good. I don’t understand how they’re not promoting the new stuff, especially holiday. They gave us that sneak peek which was very vague. Clearly there is a lot more. It will be hitting stores any day now, why keep hiding it still. A lot of other cosmetic companies have already launched their holiday. Nothing even on their website yet. So weird. I feel like Markwin’s marketing/social media people are clueless. You’re suppose to keep your customers enticed and intrigued. That’s so dumb! I remember finding last year’s collection around this time of year, so they should tell us about the flavors or at least sell them online! I don’t think it is, it looks like marketing material. I’m sure there are some repeat flavors but I know there are new ones. Marketing puts this stuff together years in advance and they probably just plugged some random holiday flavors in the pic for marketing purposes way before it was idealized. But for real….SHOW US HOLIDAY!!! 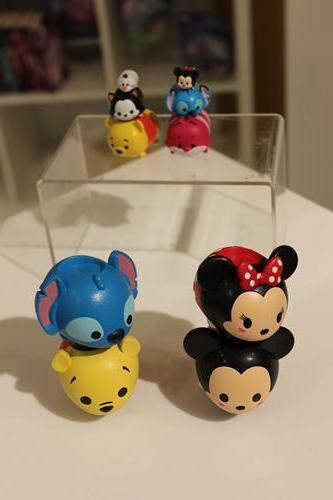 Plus they have to unveil these Tsum Tsum’s.